Before we delve into Music Theory, I strongly recommend the reader knows how to read and write musical notation as I will not translate the notation into a guitar tableture for two reasons which are as follows: I do not have the time and, most importantly, anyone who wants to take music seriously will make an effort into learning how to read and write music. However, if enough people who cannot read and write music message me, I will make a lesson on how to do it. Now, let us begin! One of the most important concepts to music is the scale for all music (read: Western) is composed to an underlying scale, whether it A major or D-sharp minor. To know basic scales is of utmost importance. What is a scale? I will define it for you. Scale: A collection of pitches in an ascending and descending order regardless of the octave. As you can see there are 42 notes present in this piece but in actuality there are 9 pitches. So if we were to take those pitches and apply them to a scale, they would look like this. Now that we have an understanding of what a scale is, let us create our first scale. Keep in mind, we will mostly work with the most common scales of the past 300 years in Western Music. Diatonic Scale: pronounced (ˌdī-ə-ˈtä-nik, die-eh-tawh-nick) which means "across the tones" uses a mixture of whole steps and half (with the occasional step and a half) to create a scale. The first pitch in a diatonic scale is referred to as the tonic. The tonic is considered the most stable tone and as we move away from it, the next series of tones become more or less stable. Due to the stability of the tonic, most melodies end on it. Solfeggio: A scale of singable vowels (do, re, mi, fa, sol, la, ti, and do) each vowel relates to a specific pitch on the diatonic scale. I have created an image which translates each of the Solfeggio vowels into its appropriate scale degree. *Any number with a little caret "^" on top indicates the scale degree. For practicality's sake, I will refer to the scale degrees in the Solfeggio or by their numbers without the carets. Major Scale: A total of seven pitches with half steps on 3-4, and 7-8 and whole steps on 1-2, 2-3, 4-5, 5-6, and 6-7. Now before we construct our first major scale and any following scales, let me explain what a whole and half step are. To understand these concepts, it is best to have a basic knowledge of the keyboard. Half Step: The distance from one key to the very next key either up or down. Here is a picture to help visualize what I mean. The black dot indicates the starting point (C) and the red dots to the left, or down the scale, (B) and to the right, or up the scale, (C♯) are the distance of exactly one half step. Whole Step: The distance of two half steps either to up or down. Again, here is a picture to help visualize. The black dot indicates the starting point (C) and the red dots to the left, or down the scale, (B♭/A♯), or to the right, or up the scale, (D) are distance of exactly one whole step. Now let us apply this knowledge of whole steps and half steps to the construction of the C Major scale. Remember a major scale has a half step between 3-4, and 7-8 and whole steps on 1-2, 2-3, 4-5, 5-6, and 6-7]; another way to think of it is as follows: W W H W W W H, in which W represents a Whole Step and H represents a Half Step. Using this blank keyboard, mark all of the appropriate scale degrees of the C Major scale. I will mark Do or C and you must fill in the rest. If you did this correctly, you should have marked all of the white keys from C to C.
C Major is not the only major scale. Every major scale uses this same formula! That formula being W W H W W W H. Now rewrite this scale but this time begin on G (this is called transposing, which will be discussed in the future). If you did this correctly, you should have marked all of the white keys from G to E and the F♯ right before G.
Repeat this exercise, but this time begin on the following notes: D, A, E, B and F, B♭, E♭, A♭. Do you notice a pattern emerge? For the C, G, D, A, E, and B Major scales, each additional ♯ is a perfect fifth (P5) from the previous ♯. For example, the G Major scale contains only the F♯ and D Major contains both F♯ and C♯, in which the C♯ is a perfect fifth above F♯. For the C, F, B♭, E♭, and A♭ Major scales, each additional ♭ is a perfect fifth above the previous ♭. For example, F major contains only the B♭ and the B♭ Major contains both the B♭ and the E♭. Now that you know that sharps and flats are necessary to understanding what scale is being used. You need to understand what a key signature is. A key signature is a short cut for composers, so they do not need to write in every signal sharp or flat in a given scale. Here is the list of Major key signatures. Memorize them. Minor Scale: A diatonic scale with more pitch variation from the Major scale (note: when notating the minor scale, keep everything in lower case. C represents major and c represents minor). Historically, the minor scale has three different forms, the natural, harmonic, and melodic. Practically speaking though, composers use all three within a given piece, so all of these forms are simply called minor. Natural Minor: A diatonic scale with half steps at 2-3, and 5-6 and whole steps for 1-2, 3-4, 4-5, 6-7, 7-8 or W H W W H W W.
Use this keyboard to construct a natural minor in the key of a. If you did this correctly, you should have marked all of the white keys from A to A.
Harmonic Minor: This form of minor has a raised 7, which results in a step and a half between 6-7. Remember, accidentals used in the harmonic minor do not appear in the key signature. Here are the half steps in this scale 2-3, 5-6, 7-8. So the scale looks like this W H W W H (W+H) H. Now, again, apply this knowledge to the keyboard. Start on A. If you did this correctly, you should have marked G♯ as the only black key. Melodic Minor: There are two forms of the melodic minor ascending and descending. In ascending melodic minor, there is a half step between 2-3 and 7-8, and descending melodic minor looks just like natural minor. Apply both the ascending and descending melodic minors to the keyboard, and as done previously, begin on A. (Hint: Only use the ascending melodic minor to go up or to the right of the keyboard and only use the descending melodic minor to go down or to the left of the keyboard). If you did this correctly, you should have F♯ and G♯ in the ascending melodic minor; descending melodic minor should look just like a natural minor. Here are the names of the scale degrees. Here is what each of the names mean. All major and minor scales relate to each other in some fashion, this is known as the relative key. 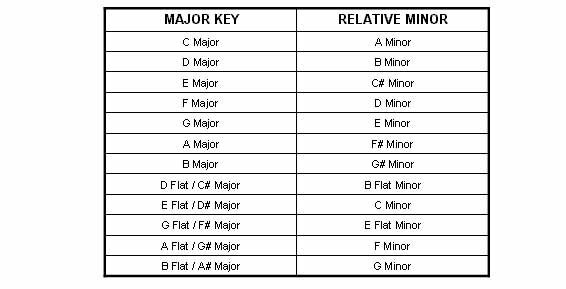 When in a Major key, to find its relative minor, look at the 6 scale degree; and when in the minor key, to find its relative major, look at the 3 scale degree. For example, d minor's relative major is F Major; F Major's relative minor is d minor. The Circle of Fifths is another useful way to understand the relationships between keys. As you move clockwise around the circle, you are moving up a fifth and as you move counterclock wise you are moving down a fourth (which happens to be the inverse of a fifth). Here is Major and minor Circle of Fifths, you should memorize this for when you tackle modulation! Major and minor keys that have the same tonic have a parallel relationship. For example, C Major and c minor have a parallel relationship despite the fact C has no sharps or flats and c has three flats. The most common nondiatonic scale is the chromatic scale, which has no tonal center. The chromatic scale consists of pure half steps from any start point to the nearest octave, like from C to C.
Whole Tone: A scale that consists of six notes all of which are a whole step apart. Todi: This is a non-Western, northern Indian mode. The last scale we will cover is the Octatonic or Diminished scale. I know I did not go over the Blues Scale and I apologize, but my music program cannot accurately demonstrate what the Blues scale is. Octatonic/Diminished Scale: This scale consists of alternating whole and half steps. And now we enter the final part of this lesson -- Modes. Hurray! The Church Modes form the entire basis of Western music, which were created from 800 AD to 1500 AD. Please note, when discussing the Church Modes the Tonic is referred to as the Final. 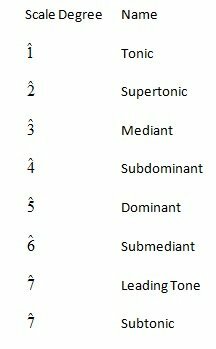 Modes I, II, V, and VII are called authentic modes because their final is at the bottom of the range. Modes II, IV, VI, and VIII are called plagal and have the prefix Hypo-. Another way to understand plagal modes is to know that each plagal mode begins a fourth below the final in the authentic mode. Modes become extremely important when we come to study counterpoint. So keep this in mind. Now to notate these modes, it is very simple. Remember that the C scale has neither sharps nor flats. The same applies to these Church Modes. Let us use Dorian for an example. The final of Dorian begins on a D and all of the proceeding notes are natural (white keys on a piano) until you hit the octave. Since this is a lot of information to absorb at once, I will assign some homework to help maintain this knowledge. On a sheet of music, notate the following scales or modes. Using these clues, name the note! 1. In the g minor (harmonic) scale, what is the submediant? 2. In the D Major scale, what is the mediant? 3. In the e minor (melodic) scale, what is the dominant? 4. In the E♭ Major scale, what is the leading tone? 5. In the f minor (natural) scale, what is the subtonic? "anyone who wants to take music seriously will make an effort into learning how to read and write music. " I haven't learned-and people accuse me of knowing how to play piano quite well. ...Oh and guitar. Besides music is played with the ears not the eyes.